In this lesson, we will learn how to divide multiples of 5 by 5 using models and how to use that to solve word problems. There are 30 students in a classroom. They sit in 5 rows. Adam writes this equation to find out how many children are in each row. Which symbol is missing from her equation? How many children are in each row? 5 books fit on one shelf. How many shelves are needed? 10 sweets are shared equally between five children. 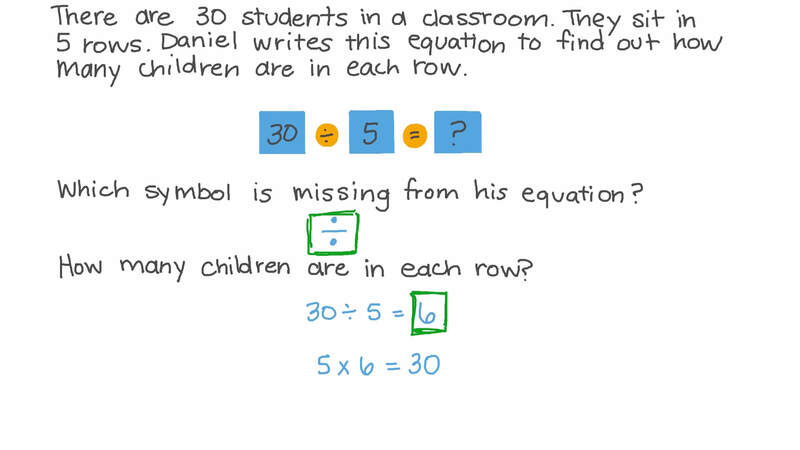 Write the mathematical operation expressing the share of each child. Maged orders 5 pizzas for a party. They cut each pizza into the same number of slices, and they have 40 slices altogether. Write a number sentence that shows how many slices they cut one pizza into. If the price of five tickets to a park is 25 pounds, what is the price of one ticket? 15 apples are going to be divided equally among 5 bags.